Its been months since may last tutorial, very recently somebody requested a printable version and while making it I realized that now days my flowers are made with a different and easier technique. I'm using exactly the same colors as Previous tutorial. So you will end up with the same result; its up to you to choose witch one is best. Go through the first bead, add 5 lob and go back into the 3rd bb, in other words jump one black bead. Make sure your pattern looks like this, one of the most common mistakes is forgetting to go through the very last bead witch was the first one. Go upwards through the first two lob Add 5 dob and go back into the 4th lob add one lob and jump to the 7th lob. Go through first 2 DOB add 5 red beads go through 4th DOB add 1 DOB 1 black bead 1 dob go through second dob of next petal. Repeat until you finish the circle, making sure you end up with 6 red petals. Go back through the first 2 red beads add 5 Black beads and go back through the 4th red bead . Add 3 red beads go into the next black bead add 3 more red beads go back into the 2nd red bead in the next petal. Repeat till you have 6 black petals. This time the repetitive pattern changes, this is our last petal, so instead of only going into the first 2 black beads, We are going to go through 4, then add 3 black beads and go dawn to the middle red bead making a side of our petal. 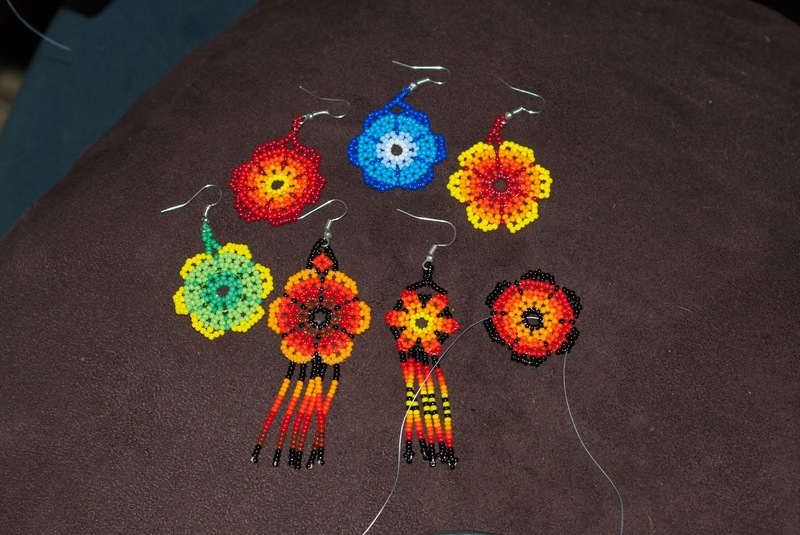 Then add one more black bead and connect with the next red middle bead, repeat previous step until you have 6 petals.